A380-140N : 2011 - Custom stamp Austria "A380 Lufthansa D-AIMG christened 'Wien'"
N°A380-140N : 1 value Personalized Stamp Austria 2011, 70c “Taufe Airbus A380 D-AIMG auf Wien” adhesive. 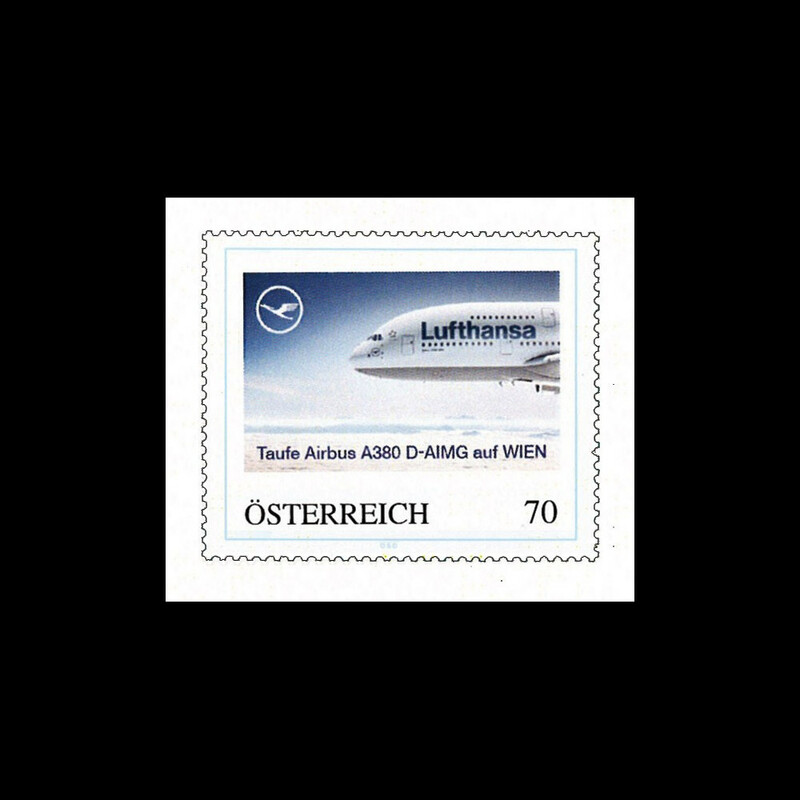 This personalized stamp was issued to commemorate the baptism of the Airbus A380 D-AIMG from Lufthansa Company on August 22, 2011 to Vienna, called "Wien". A380-119N : 2011 - First personalized stamp Germany "Lufthansa Airbus A380"
A380-132 : 2011 - FFC AUSTRIA "A380 Ovebria 11 - 45th Congress FISA - Flight Wien-Graz"
A380-132N : 2011 - AUSTRIA Personalized Stamp "A380 - FISA Sonderflug Wien-Graz"
A380-139N : 2011 - Custom stamp Germany "A380 Lufthansa D-AIMG christened 'Wien'"
A380-141-143N : 2011 - 3 Perso. Stamp FRANCE-GERMANY-AUSTRIA "Naming A380 Wien"
A380-141C1 : 2011 FRANCE Collector Booklet "Ceremony of Naming A380 'Wien' Lufthansa"
A380-141C2 : 2011 FRANCE Collector Booklet "Ceremony of Naming A380 'Wien' Lufthansa"